I've figured out as soon as I get into the 'arena' i'm going to pretend i'm in the Hunger Games. Watch out guys, I'm gonna be viscous. After that we all qued up in our body gear to get our guns. (I rekon the guns were bigger than some of the other little kids playing) We walked down to the area where we would play (well actually we slided down to the area, as it was SO SO boggy, almost up to your knees!) After another short breifing, mainly about our helmets being kept on at all times again, we began. The whistle blew and off we went. I tried to stick to my group but gave up as I wanted to survive myself. I was eventully the last man standing with 2 other blues (1 had no bullets though) and one other red. I stayed down and shot the guy right in the head. BOOM. At the end the man said we were the best he's seen that day, and we were far better than the boys. Hell yeah. 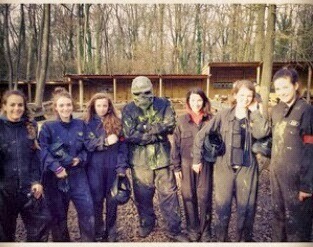 After running round in ridiculous suites, tripping of overalls, wallowing in mud, being splattered in paint, getting roasted like a turkey and trying to survive the terminator, I think it was one of the best days of my life.